Cellulite is yet another issue the beauty-conscious modern woman is worried about. You can have it irrespective of your weight and build. Cellulite is so common, studies reveal around 80 to 90 percent of women have it. 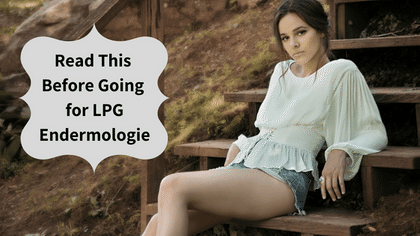 If you are looking for ways to get rid of cellulite, sagging skin, and other such issues, you must have come across LPG Endermologie as one of the most popular methods for smooth skin. This French technology is around for decades and is popular even with many celebrities for good reason. But, you may have a few worries regarding the treatment. Does it really work? Is it worth it? We’ll talk about these and other doubts that you may have about LPG Endermologie. Read through them for more clarity before you book your first lipo-massage appointment. Am I a good Candidate for Lipo-massage? Lipo-massage is a non-invasive and natural procedure. It uses rollers for a deep and pleasant body massage. So, the treatment can be said to be relaxing and is suitable for almost everyone. While any amount of diet and exercise might seem to be of no use to give any result, muffin tops, saddlebags, and other unwanted shapes can easily be treated with lipo-massage. Lipo-massage can help you tone your skin and get rid of sagging and thinning skin. Many celebrities have used lipo-massage to maintain the radiance of their skin. The treatment works to address the issues of the post-pregnancy body including localized fat, cellulite, bloating, and sagging skin. LPG addresses these common issues. Your body is unique; everybody reacts to treatments differently. So, although results cannot be guaranteed, statistics say that ninety percent of people have found positive results from the treatment. LPG Endermologie is an FDA-approved treatment. It is the first anti-cellulite treatment that the FDA has approved (in 1998). Its approval as a Class 1 Medical Device implies that it has the least possible probability to cause harm to the user. Our experienced estheticians will take care that you are comfortable during the treatment. Not much. Lipo-massage is aimed at reduction of cellulite and sagging skin. So, you will get a toned look to your skin. But, it does not help a lot in losing weight. If you are already in a weight-loss program, LPG treatment can help by reducing the appearance of sagging skin because of rapid weight loss, if it is done regularly during the weight loss program. If weight-loss is your main concern, you can combine this massage with a healthy weight -loss program to tone your skin while you lose weight with a combination of healthy diet and exercise. The treatment can cause a slight reduction in the circumferential measurements of your body and thus, make you feel good about your achievements. Drink lots of water. This will help your body to get rid of the fat and toxins released from the cells during the massage through urination. Also – exercise before and after for best results. While lipo-massage can work even if you do not do anything, you can see faster and better results if you lead an active and healthy lifestyle. Even light to moderate activity can make a difference. LPG Endermologie boasts of 0 side effects. It is quite a gentle procedure. Most people describe the feeling as a relaxing massage. You may feel the vibration of the rollers. The first couple of sessions may be a tad painful depending on how sensitive you are and how much cellulite an area has. Bumpier regions of the skin may be a little uncomfortable. If your skin is sensitive, you may find slight bruising of the skin due to the deep massage. This should subside soon after the session. This again varies from person to person. Ideally, 10 to 20 sessions are recommended at the rate of 1 to 3 sessions of 35 to 50 minutes per week. Thereafter, a session a month is recommended to maintain the results. No cellulite treatment has been found to be permanent yet. Results from LPG Endermologie last quite long though. They last for up to 6 months for most people. They will last better if you follow a healthy lifestyle with moderate regular exercise. Follow-up treatments once a month after the initial treatment help to maintain the toned skin. With such a high rate of success, LPG Endermologie is totally worth it for a smooth skin and for boosting your confidence. Also, most beauty salons offer packages that reduce the overall price of the treatment. For example, at Ministry of Beauty, we offer a course of 10 30-minute sessions for £400 and a course of 10 60-minute sessions for £600. We hope we have provided answers to most of your queries regarding LPG Endermologie. Do talk to us if you want to know anything more about lipo-massage. Whenever you are ready, book an appointment with us for session recommendations for your specific skin condition.